This report focuses on luxury retail – a specialty area within Boyden’s global consumer & retail practice. Looking at changing demographics in the global consumer population and emerging economies in particular, we explore fast growth markets in the Middle East and Asia. 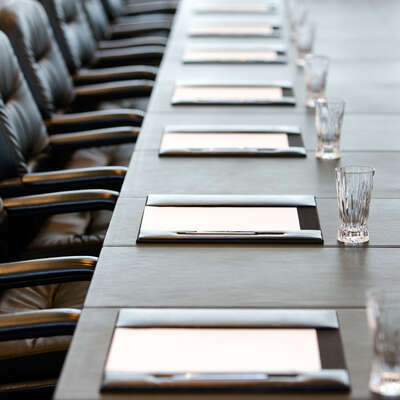 From this, insights emerge as to the senior executives who will be most successful in achieving strong growth projections, and what clients need to know about acquiring high performers through retained executive search. With global GDP growth forecast at 4% in 2014, business leaders continue to revise growth plans across mature economies, emerging markets and fast growth countries. During the global economic downturn, organisations in every sector fought to maintain their market position, with one notable exception: global luxury goods delivered double-digit growth for four years straight, from 2010 through 2013. A fifth year of double-digit growth is expected in 2014, in a global market now worth nearly US$280 billion. Looking ahead, analysts predict worldwide luxury goods revenues to grow 50% faster than global GDP, with an expected average of 5% to 6%, driving revenues towards US$350 billion by 20153. Behind this growth is an unprecedented surge in the global luxury consumer population. New buyers in mature markets and a burgeoning middle class in emerging markets have generated a more than threefold increase in luxury consumers; from 90 million in 1995 to 330 million in 2013. With increasing participation from fast growth countries, as well as second and third tier cities, analysts forecast an estimated 400 million luxury consumers by 2020 and 500 million by 20304.
Who are these consumers, where do they present the strongest opportunities, and how can luxury brands capitalise on such glittering potential? In recent years, we have seen a major shift from a relatively homogenous group in mature economies to a diverse luxury consumer population in different geographies. Consumer populations are increasingly segmented. Bain & Company’s seven “new faces” categorise consumers according to a combination of tastes, behaviour, gender, age, region or country, and spending patterns, as shown in Exhibit 1. There are shoppers from each of these segments in every major luxury market, due to shifts in both consumer demographics and tourism. Tourism is creating regional hot spots, and a broader approach to luxury, beyond shopping, to luxury experiences in branded stores, malls, hotels and the airlines that serve them. “The global high net worth and ultra high net worth communities are increasingly mobile”, says Athena Tavoulari, a Partner in the Consumer & Retail Practice at Boyden Middle East, based in Dubai. “Tourism is therefore influenced by a thirst for high-end experiences and luxury acquisition destinations, particularly in the Middle East, Southeast Asia and other emerging markets with a reputation for luxury”. What does this mean for luxury retailers? Tourists are seeking out new destinations and showing more savoir-faire with regards to the items they purchase. They are also a fast-growing luxury demographic. Globally, in 2013 international tourist arrivals grew by 5% to 1,087 million arrivals – a year-on-year addition of 52 million – and a 4% to 4.5% increase is forecast for 2014. 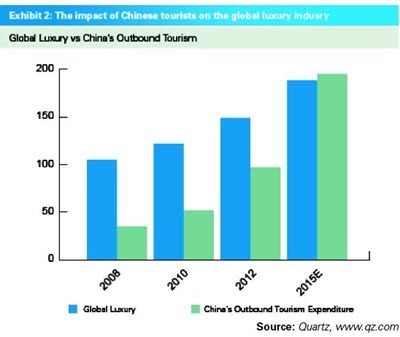 Chinese tourists dominate predictions for the global luxury market. The easing of official restrictions on foreign travel leads analysts to forecast 100 million Chinese citizens will travel abroad by 2015, compared with 10 million in 2000. Morgan Stanley forecasts that in 2015, Chinese tourists could spend US$194 million a year in global holiday hot spots. Exhibit 2 shows that in just seven years, they are expected to outspend all luxury consumers globally. Where are the strongest opportunities? The trend towards distinctive luxury items and a more bespoke, customised experience is heating up markets in the Middle East and Asia, where leading brands focus on acquisition hot spots. The Middle East has seen a rapid increase in demand, particularly for collectibles and unique items from Richemont-owned brands or “Maisons” such as Jaeger-LeCoultre, Vacheron Constantin, Van Cleef & Arpels, IWC Schaffhausen and others. “The UAE, Qatar, Saudi Arabia and Kuwait are extremely dynamic markets offering high growth potential”, comments Alban Belloir, Managing Director for Van Cleef & Arpels, Middle East and India, based in the UAE. “The development of these markets is an ongoing trend and with events such as Expo 2020 in Dubai and the 2022 World Cup in Qatar, the level of attractiveness has never been so high8”. Dubai is the biggest magnet in the Middle East, commanding around 60% of the luxury market in the UAE and 30% across the Middle East. 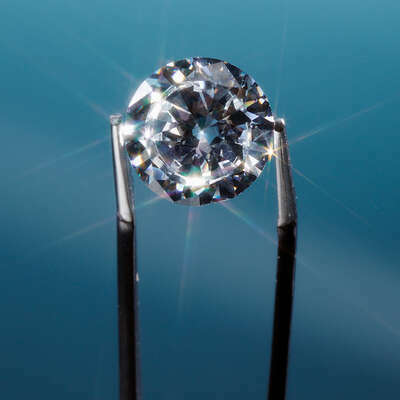 This is due in part to attracting foreign luxury consumers from the United States, Asia and Europe, in search of a wealth of luxury items and experiences. “The market has changed dramatically in a short period”, says Alban Belloir. “We had to respond quickly and hire experts in retail, CRM, digital, supply chain and other areas to bring high-level technical expertise to the luxury sector”. Investment in transport and infrastructure, hotels, offices and residential units have provided strong foundations for further growth in the luxury sector in the region. “The Middle East is now one of the top ten luxury goods markets in the world and is synonymous with high-end lifestyles and luxury experiences,” says Tavoulari. Stoking demand is the region’s airline industry – which has a strategic focus on global destinations – with Emirates Airlines and Qatar Airways voted the top two airlines in the world and Etihad Airways in seventh place9. These airlines are bringing in high numbers of tourists to join local populations of oil-rich luxury consumers in the Middle East. “One of the distinguishing characteristics of our local clientele is their desire for limited edition, exclusive designs”, comments Alban Belloir. “Van Cleef & Arpels leverages this opportunity by offering a custom-made approach to our clients. If you understand the market in terms of product offering, service and high-level customisation, you can achieve significant results”. Visitors to Dubai and Abu Dhabi are attracted by luxury boutiques, high-end hotels and iconic shopping malls, such as the Dubai Mall, Mall of the Emirates and Galleria Mall in Abu Dhabi. Together with Vivo City in Singapore, these malls form the upper echelons of tourism-driven luxury shopping. “Demand in the United Arab Emirates is also driven by expatriates, due to strong economic growth and ongoing job creation”, says Tavoulari. “For luxury brands in the Middle East, this means hiring multicultural executives into c-suite, director and management roles”. “Diversity is very important in our hiring plans”, confirms Belloir. “We bring people with international backgrounds from countries such as France, Italy and Russia. We also need to have good Middle East representation within our team, which is essential for communication, PR and media – people who speak Arabic and understand the culture, codes of behaviour and how to approach clients”. Karoline Huber, Brand Director, Middle East & India at IWC Schaffhausen agrees. “It is important to understand the motivation and drivers that build loyalty among luxury clients. At IWC, we believe loyalty comes from people – it is more about human resources than segmentation and CRM systems. 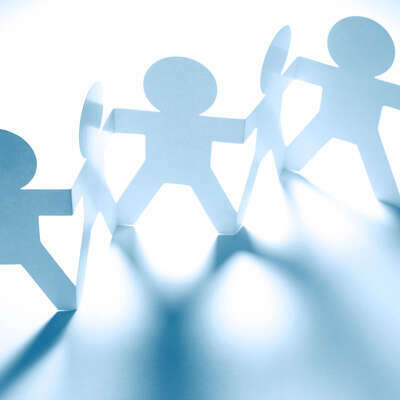 Our people development and talent management are therefore driven from the product level, creating client loyalty through emotional connection and personal experience”. Huber sees executive development through product channels as the best solution to a dearth of talent, with holding company Richemont’s talent management program being particularly effective at creating loyalty among key talent as well as clients. IWC also pursues a localised, dedicated approach, for example personalising the ambassador concept with football great Zinedine “Zizou” Zidane hosting a charity match in Abu Dhabi. “This is part of IWC’s strategy to create loyalty through stories and people that is emotionally engaging beyond the product”, explains Karoline Huber. “Stories touch people in a way that advertising can’t. IWC has created huge assets with the stories it is promoting and supporting around the world. They are all authentic – investment in Galapagos through the Charles Darwin Foundation, the Formula One engineering partnership, ‘For the Love of Cinema’ – and varied areas of human interest”. The Middle East is almost a microcosm of the global luxury market. Multinational subsidiaries, conglomerates and single brands compete in markets distinguished by a constant transfusion of global consumers, representing every segment in the luxury market. During the global economic recession, sales of luxury goods in Mainland China rose by 16% to more than US$10 billion in 2009. By 2015, China is expected to account for about 20% of global luxury sales, at US$27 billion. Wealthy consumers dominate luxury consumption. However, China’s upper middle class, currently around 12% of the market, is expected to account for 22% of luxury purchases by 2015. The majority of luxury goods companies are already in China and making further investments. With exposure to more brands at home and on the Internet, Chinese consumers are increasingly savvy, knowledgeable about brands and differences in pricing – typically higher in mainland China than in Hong Kong. As more consumers develop an affinity for luxury, the focus is shifting to wellness and in-store experiences as well as products. While internationally well-known brands are highly valued, the focus is increasingly on products designed for the Chinese market, incorporating Chinese designs and imagery. From a talent perspective, China is a very hot, competitive market, typically led from large corporations headquartered in Shanghai with satellite offices in Beijing or Guangzhou. The talent pool is distinctive in its mix of expatriates and PRC executives. Ami Bhatt Hardy, Managing Partner of Boyden Greater China in the Consumer & Retail Practice reports, “Organisations need extensive China experience from everyone they hire, whether it is for a China-based position or for a role located in the regional office in Hong Kong or Singapore." A few years of hands-on experience, in situ, in China is important for China-based roles. With new brands constantly entering the market, increased competition means companies require senior-level executives to have an extensive track record in handling issues relating to all areas – including talent acquisition, piracy and product positioning – gained from a previous, comparable China-based position. Marketing roles at luxury and retail companies have evolved, so there is a greater need to hire marketing talent with more of a classic brand management background. Those with both CRM and insight-driven marketing experience are highly sought-after given today’s more sophisticated consumers. With so much competition, are brands hiring from outside the sector? There is much debate on this topic. “In Asia, we encourage clients to look at executives in the consumer goods sector, particularly for marketing roles where they can add more sophisticated techniques to branding efforts. For other core roles, we advise clients to consider candidates from non-luxury retail as well”, Hardy comments. The luxury market in India accounts for 10% of total retail and is expected to be worth $15 billion in 2015. Luxury retail in India is distinguished by a twin focus on short-term luxury products, notably jewellery, and long-term investment in luxury assets, particularly cars. This segment shows the highest growth rate – driven by a wider choice of brands and rapid increase in millionaires in tier one and two cities – leading to a value of US$8 billion in 2015. In keeping with other emerging and fast growth markets, consumers in India are increasingly attracted to luxury experiences and services, with hotels, travel, tourism and bespoke concierge services particularly buoyant. “Trends shaping luxury retail in India are local market strategies, digitalisation, sustainability, consolidation versus niche opportunities and products made in other emerging economies”, explains Shalini Kandhari, Senior Consultant and Consumer & Retail Practice Lead at Boyden India based in Mumbai. “Growth is driven by an ever-evolving base of consumers, particularly ultra high net worth households. Companies are launching entry-level brands to help a growing pool of consumers in non-traditional markets – regions beyond metros and tier one cities – to trade up”. The longer-term shape of luxury retail in India is hard to predict, due to challenges all industries face, such as insufficient infrastructure and more specifically, the lack of an appropriate retail environment. For now, a lack of infrastructure is shaping the industry. “This is leading to innovative business models and local tie-ups to optimise investment and minimise risk”, explains Kandhari. Karoline Huber of IWC Shaffhausen comments, “In India, it is common practice to invite a brand representative to your home to provide hospitality and view luxury pieces in a domestic environment, rather than a boutique or shopping mall”. This reflects a natural affinity for luxury in India. “An understanding and appreciation of luxury is deeply rooted in Indian culture, from the fine garments of the silk road to filigree jewellery”, Huber adds. “This means we don’t have to educate people on luxury in India”. Indian and Chinese consumers share a desire for products made in emerging markets, driven by a thirst for cultural influences in design. Lifestyle brands are signing up with designers, and hiring relationship managers who speak local languages and can customise their offerings for festivities such as weddings and other events. How can luxury brands realise growth potential? For luxury brands, the realisation of double-digit growth potential depends on a combination of factors. Strategic investment is driving demand for senior, experienced leaders in luxury retail from HR, finance and managing directors to brand, operations and supply chain directors. How can luxury maisons attract these leading lights? “Over the last ten years, the Middle East has matured as a talent market”, comments Tavoulari. “Our team is in touch with a number of high-performing candidates from mature markets such as the United States and Europe, attracted by a high-growth environment that offers significant personal and professional rewards”. Does every assignment therefore involve a global search? “Due to the nature of the market – diverse luxury consumers, tourism-based acquisition and a multinational population – almost every search involves a regional or cross-border dimension”, confirms Tavoulari. “And this is a natural way of working at Boyden. We collaborate on a daily basis with clients, candidates and colleagues from the United States, Europe, Asia, Australia and Africa”. Global mobility can be a challenge, primarily due to family commitments. However as Tavoulari explains, “C-level and other senior candidates from a number of mature markets form a strong talent pool. They find Dubai particularly attractive due to the lifestyle, tax-free environment and access to other countries in the Gulf”. Expatriates make up the majority of the workforce in the region – as high as 90% in some GCC (Gulf Cooperation Council) countries. The tax-free environment is a major attraction, together with housing, transport and increasingly, education allowances – which are all important given the rising cost of living. Remuneration packages are typically 60% base salary and 40% housing and transportation allowances, plus a number of different incentives and bonuses. Medical plans are a perquisite and ‘end of service benefits’ are legally binding. These replace pension plans in practical terms and typically amount to one month’s salary for each year of service up to five years, rising to one and a half months’ salary for additional years of service. Another challenge for organisations investing in executive talent is that the best candidates are often not looking to move. These candidates are not accessible through recruitment agencies, which engage only with candidates who are between roles or unhappy in their current organisation. “This is why the market mapping we do in retained search is so important in a competitive environment,” says Tavoulari. “When we have a c-suite or director assignment, we map the most impressive executives in the sector globally or within a targeted region. This is a critical success factor – identifying executives who may be open to a new role once they understand the career and lifestyle potential”. Senior candidates need an executive search consultant who engages with them as a peer. This means explaining a career opportunity in a global context, combining regional and global perspectives on sector trends, remuneration packages and career outlook. What kind of candidates do clients need in the Middle East? “We help our clients to acquire candidates who offer flexibility, skills around diversity, multi-cultural understanding and an entrepreneurial spirit. Alongside luxury retail expertise, these are the most significant competencies for success in emerging markets, particularly the Middle East”, adds Tavoulari. At Van Cleef & Arpels, the focus is on a combination of expertise, culture and personality. “In order to find the right executives, we know we need to be flexible and consider candidates in other sectors. So, we look for specific competencies and skills in a function – with the differentiating point that they must be passionate about our field”, explains Belloir. At IWC, Karoline Huber’s perspective is based on the value human resources bring to the business in terms of brand loyalty and competitive advantage. “With small talent pools, it is less about coming from luxury and more about understanding that luxury has its own characteristics. The true value of human resources is still under-appreciated. If you pay more attention to your people – and regard HR as your most powerful tool – this can easily become your competitive advantage”. The talent pool in Asia is comprised of Western expats, Chinese expats and local Chinese executives. This last group – particularly for general management roles – has grown, due to China’s rapid maturity as a luxury market and exposure to expatriate practices. Remuneration is dominated by expatriate packages in China. Hiring local Chinese executives instead is not necessarily as cost-effective as before; competition for Chinese nationals is pushing up salaries and executives tend to move only for a high premium. In Hong Kong, the expat package is less common. Still, Asia/Pacific regional leaders or executives from Paris or Milan for instance, would be treated as expatriates. What are the hot jobs? Regional managers, general managers and marketing leaders are hot jobs requiring experience in the luxury sector. Functional leaders can come from other industries, but general management and marketing roles require experience in luxury, particularly in China – the big magnet for growth. Succession planning is one of the top priorities for Asia in the next few years. There is a huge gap between top executives and the next tier down, where managers need better development and training, and mentors from Paris, London or New York for example. Mobility is another challenge. Western expats move willingly to Shanghai, Singapore and Thailand for instance, whereas Chinese coming from Hong Kong tend to resist moving beyond Hong Kong or China. With so much competition, building a pipeline of talent is essential. “Many executives in the US and Europe are keen to come to Asia, to be part of the rapid growth in the luxury sector”, says Hardy. “Talent management programmes that provide the right exposure, training and development would help address resourcing challenges”. The global luxury market's greatest challenge is the acquisition and development of talent. 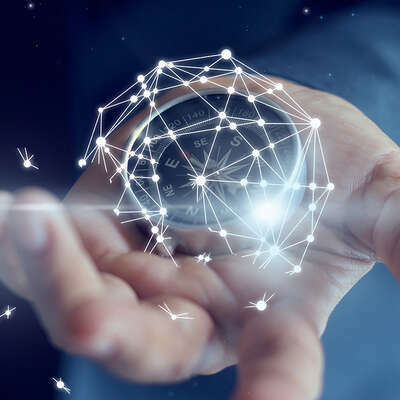 While growth prospects drive expansion into new segments and markets, brand leaders are competing for executives with the right exposure and track record to deliver expected returns. What drives the most advanced brand champions is being in an industry where people can make the greatest difference. Karoline Huber of IWC explains, “Luxury is based on emotion and it is people who create emotional differences. Competing on product provides less advantage – but using people as a competitive differentiator creates the emotional benefits that drive loyalty, protect brand value and build brand equity”. She continues, “We have a responsibility to change things for the better in a sustainable way – by introducing the new generation of leaders for the business. This means leading by example and transferring values to the team. This is why is it important to drive HR from the product level – to achieve emotional connection”. Ultimately, luxury is about a very personal experience of craftsmanship and design. “It is also about the executives who nurture and bring the creative talent of their fellow human beings to the rest of the world,” Tavoulari concludes. Boyden is a global leader in executive search and talent advisory services with more than 70 offices in over 40 countries. Founded in 1946, Boyden specialises in senior executive search, interim management and human capital consulting across a broad spectrum of markets and sectors. Boyden’s global luxury retail team works to support CEOs and other c-suite leaders in complex global markets. For every assignment, we create a bespoke regional or global search team combining local market experience with sector skills and c-suite expertise.